Announcement: Effective 9 May 2014, the LCCT terminal featured here had been closed and all budget airlines that were operating here have been moved to a bigger and better terminal known as KLIA2. 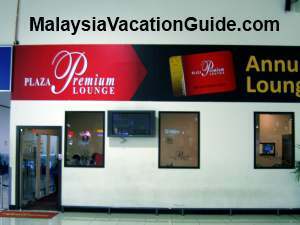 LCCT is the Low Cost Carrier Terminal for AirAsia, the "no-frills" budget airline based in Malaysia. This terminal had undergone extension once to cater for the increasing passengers that use this airline. A new terminal low cost terminal known as KLIA2 is currently being built near the current KLIA which serves full fledged airlines. 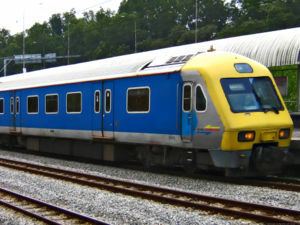 It will have better facilities and can cater for more passengers and is expected to be operational by 2013. The present terminal has most of the basic facilities of an airport although it cannot compared to Kuala Lumpur International Airport(KLIA). Taxis, buses and private vehicles are the main mode of transport to and fro the airport. Parking bays are available if you intend to leave your vehicles at the terminal while you are away. 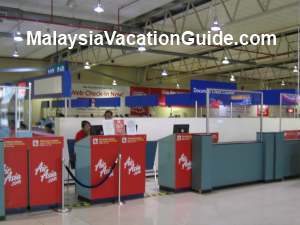 The check in counters at LCCT. It is better to do a WEB check-in otherwise RM10 will be charged by the airline. 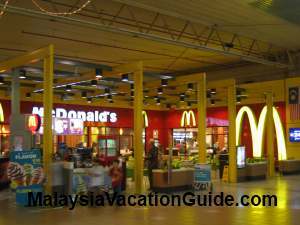 The fast food chain restaurant McDonald is located inside the terminal. While you are here, there are many choices of food and beverages. Inside the terminal, there is the McDonald restaurant where you can grab your burgers and fries if you are in a hurry. Asian Kitchen serves asian cuisine. The Coffee Bean has an outlet here as well. If you have the time and are looking for a more variety of choice, head for the Food Garden food court which is located just beside the terminal. KFC restaurant is located here. There are also many stalls that sell local Malay, Indian and Chinese food. As with any airport terminal, the price of the food here is slightly higher compared to what you will get in the city. The LCCT Food Garden food court. 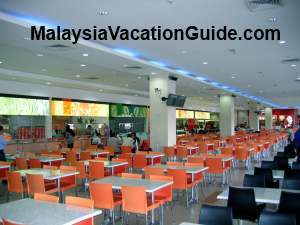 The air-conditioned and spacious food court that serves local cuisines. KFC is also located here. The entrance to Plaza Premium Lounge. The lounge with facilities such as shower, lounge, food & beverages, internet computers and TV. 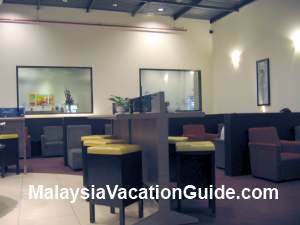 Many credit cards companies provide complimentary use of the lounge for their members. If you are holding a Citibank Platinum credit card, you are entitled to use the lounge free of charge for a specified amount of hours per year. Check out with your credit card companies for the use of this facility. Call the lounge at Tel : +60 3 8787 1766 for more information. If you intend to leave your luggage at the terminal, you can do so at the Talasco Baggage Solutions which is located at the Domestic Departure Terminal. You can leave your luggage for as many days as you want to. Lockers are also available for rental but the size is limited. Details of the charges is as shown in the table below. If you are driving to the terminal and prefer to park your vehicles here, you can do so at the many car park bays. The charges for 16 hours to 24 hours parking at Zone A which is nearer to the terminal is RM40.50. The charges per hour is RM3.50/hour for the first 3 hours followed by RM2.50/hour for the fourth hours onwards. If you have the time, you may want to park further away from the terminal at Zone C. The charges for Zone C for for 16 hours to 24 hours is RM33.50. The charges per hour is RM2.50/hour for the first 3 hours followed by RM2.00/hour for the fourth hours onwards. All parkings are 24 hours operated and are fully gated. Chip Coins are used and as with any parking facilities, parking here is at your own risk hence it is always a good idea to lock your vehicle and remove any valuables from the car. If you intend to take a taxi on arrival at the terminal, head for the ticketing counters as you leave the custom declaration area. You can purchase the budget taxi, Premier taxi(higher price) or Family coupons at these counters. The prices to Kuala Lumpur city is about RM74.80(Budget Taxi), RM102.60(Premier Taxi)and RM200.20(Family). You will need to provide the location of your destination to the ticketing counters agents before they can give you the price. A more budget way to travel from LCCT is by using buses. 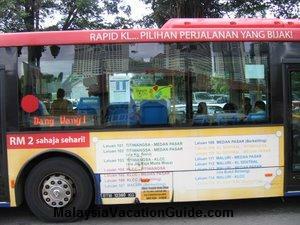 The price per person for a one way trip using Skybus to KL Sentral is RM9.00. Skybus also service the route to 1 Utama. Aerobus goes to KL Sentral for RM8.00 one way. 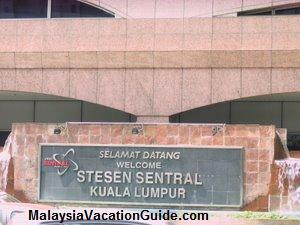 Star Shuttle route include going to Pudu Sentral, Ipoh and Sitiawan. SkyVans goes to Cameron Highlands, Genting Highlands, Port Dickson, Melaka and Penang. This is the main airport where most of the full fledged airlines use. 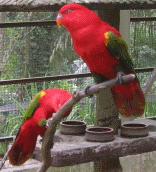 Tourism is one of the main activities on this duty free island located at the north west of Peninsular Malaysia.